Most of last week we were on a trip to Sydney together with the "Snorkparents". 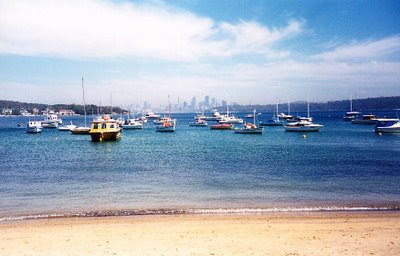 The picture is the view from Watson's Bay of the Sydney CBD. Snorkdad said "Hong Kong" when he looked at this view and I replied "bu shan" (no mountain). I took them (while Snork Maiden was at her conference) on a trip to Circular Quay on the ferry to Watson's Bay, on a walk around South Head, fish and chips lunch, bus to Bondi Beach (snoozing in the sun for them and swimming for me) and back to the city. We are getting quite good at a few words of Chinese and English and lots of gestures. On Thursday I gave a presentation at the University which went well until someone asked a question I wasn't prepared for about stuff I haven't done yet but plan to do and my mind froze. I did manage to partly answer his question in my answer to the next question. I didn't get a good impression of the department though and all of us feel glad to be back in Canberra and don't relish the idea of living in Sydney. So maybe it's all for the good... Sydney's a great place to visit (apart from scratching the car in a parking garage and getting a parking ticket). Snork Maiden just heard that she got accepted for a two week course in England - only problem is that is the second two weeks of June. And the meeting in Italy is the last week of May. I won't hear till Wednesday about the paper I submitted to a conference in Venezia in mid June and about a conference in the Netherlands till April 17th. Unfortunately, Snork Maiden wouldn't be able to come to Venezia with me. We'll have to see what Snork Maiden's supervisor thinks about such a long absence too... But soon we'll have to start booking flights and getting visas for her. Book Review: Tim Ferriss - "The 4-Hour Work Week"
Day Starting Badly.... Will it End Well?